BANGKOK, Nov 27 – Thailand is forecasted to lose approximately Bt16-19 billion in revenue from the loss of 400,000-750,000 foreign visitors as a result of the ongoing flood crisis should it conclude by December, according the Tourism Authority of Thailand (TAT). This figure was reported to the Tourism and Sports Ministry on Sunday, said Tourism and Sports Ministry Spokesman Watchara Kannikar. The number of domestic tourists was also predicted to fall by about 6 million by the year-end, representing a loss of about Bt13 billion in revenue, resulting in a total tally of domestic and international travellers for 2011 at 18-19 million. 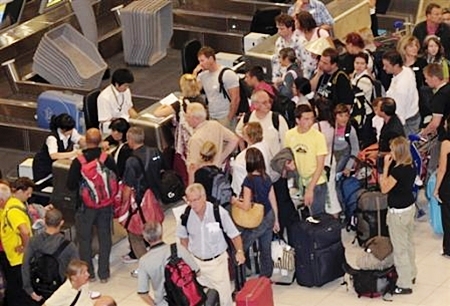 TAT pointed out that foreign visitors have either cancelled or delayed their trips to Thailand owing to the enduring image of flooded Don Mueang Airport, the issuance of travel advisory against Thailand by many countries, and rumours of contagious diseases resulting from floods. As the overall flood situation has improved, Deputy Prime Minister and Tourism and Sports Minister Chumpol Silpa-archa assigned related agencies and personnel to clarify the situation to foreign countries and many have already cancelled their travel advisories against visiting Thailand. Concerning rumours of contagious diseases, the ministry – together with the Ministry of Foreign Affairs and the World Health Organization (WHO) – would clarify the matter by this week to ease fear and tension among travellers. The Tourism Authority of Thailand, meanwhile, proposed to the Tourism and Sports Ministry its plans to revive the country’s tourism, such as tourism promotions and activities as well as marketing communications both for domestic and overseas markets. About 500 members of the press and media worldwide have already been invited by the TAT as a part of the plans and will be visiting Thailand on Dec 13. According to Tourism Department’s statistics, the cost of damages from flooding at 175 tourist attractions in 21 provinces countrywide was estimated at nearly Bt560 million.